Dancers shout merde at each other all the time. Beautifully coifed women in Swarovski crystal laden gowns and dapper men in suits and tails shouting merde at one another around the ballroom seems odd, but it’s how we say good luck. The custom is rooted in NEVER saying good luck to performers because silly superstition dictates that to do so actually causes bad luck. One says break a leg to thespians, musicians and singers, but obviously no one in his right mind is going to tell a dancer to break a leg so we say merde instead. I know, it’s weird. There’s a logical explanation for how the custom came about, but that history lesson is a topic for another blog. 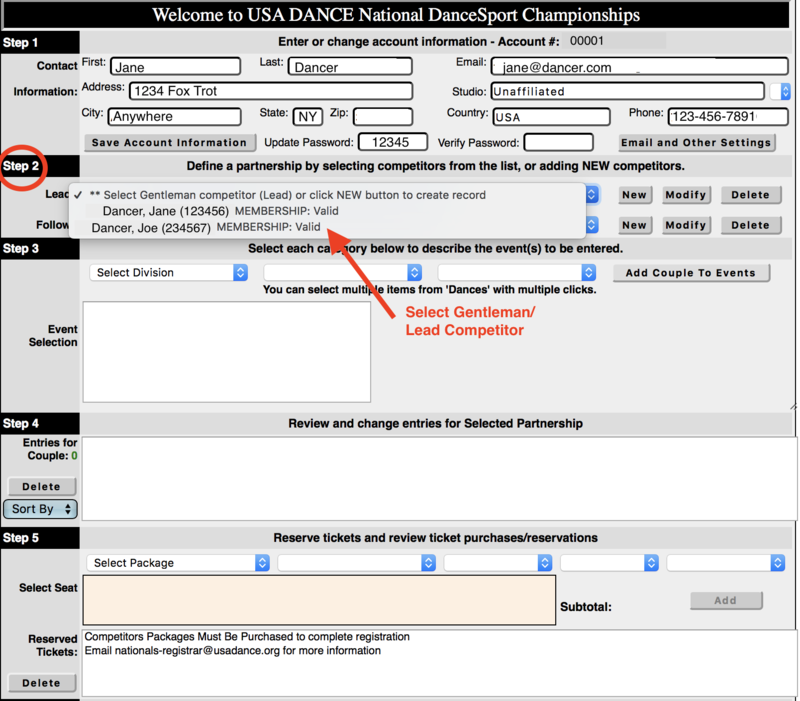 Today’s discussion on shouting merde will center on the recent pandemic of fear and frustration spreading among dancers attempting to register for the impending USA Dance National DanceSport Championships. If you find yourself in the predicament of shouting merde because you worked hard all year to qualify for nationals, but you fear you may never actually get there because, in spite of repeated attempts, you are UNABLE TO COMPLETE REGISTRATION PROCESS…relax. Take a deep, cleansing breath. Go ahead and shout merde a few times if it makes you feel better, but rest assured The Dancing Housewife (a.k.a the unofficial o2cm tech support rep) has come to the rescue with another set of step-by-step instructions, complete with screenshots. Steps 1 through 4 of the o2cm registration process are the same for Nationals as they have been for every other USA Dance competition. Confusion happens in Step 5. 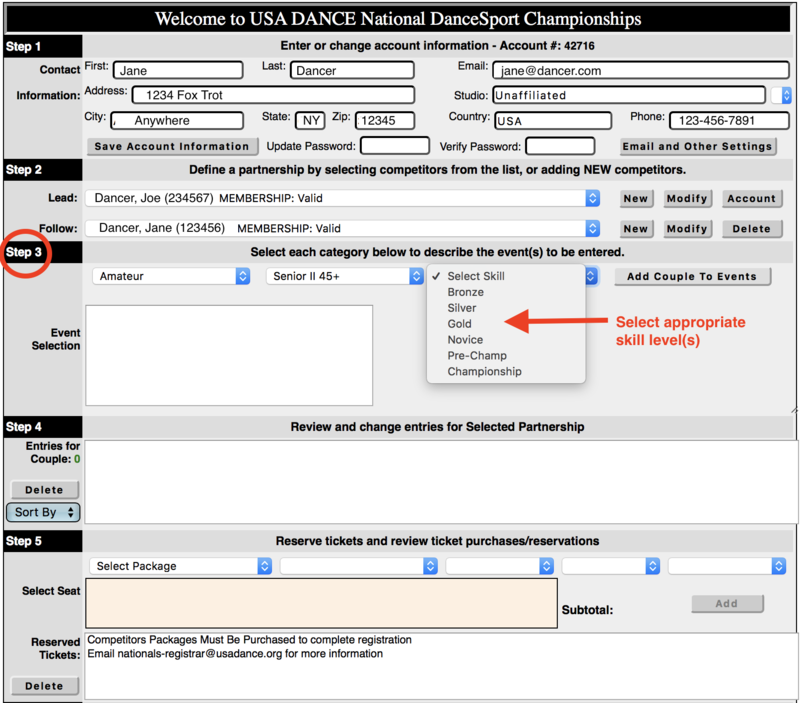 Unlike NQEs and other USA Dance sanctioned events for which couples pay a flat registration fee, competitors are charged a fee-per-event (per couple calculated from the events selected in Step 3), plus a small flat registration fee to compete at nationals. 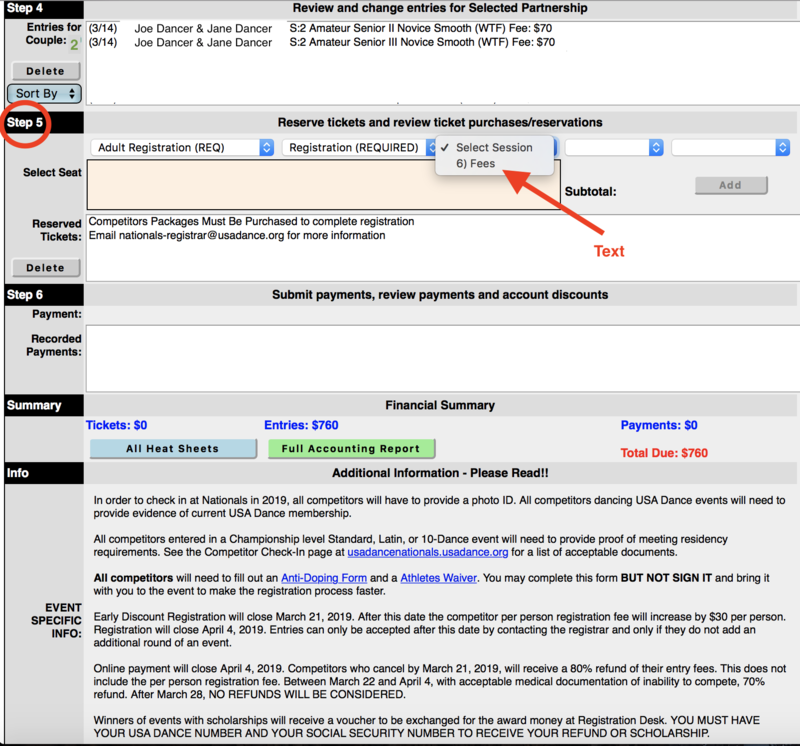 To complete the registration process, one must select the appropriate competitor registration – either Youth Registration (REQ), Adult Registration (REQ) or Pro Registration (REQ) – from the Select Package drop down menu and complete the remaining fields in Step 5 for each competitor of the defined couple. 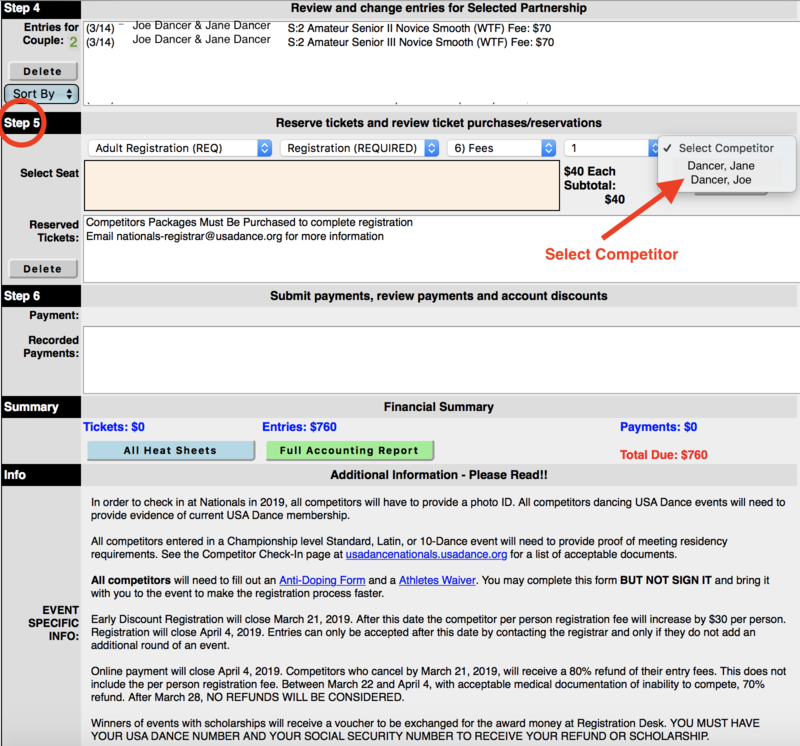 If you neglect to select the competitor registrations, there will be no payment option in the Financial Summary section and you will not be able to complete the registration process. Let’s review. 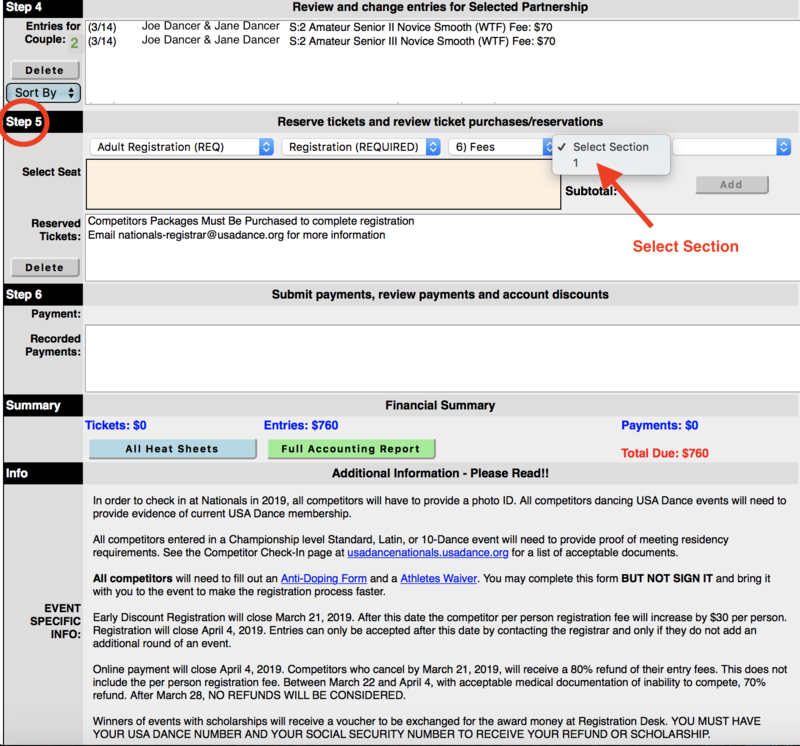 Step 1: Enter, confirm or edit account information. 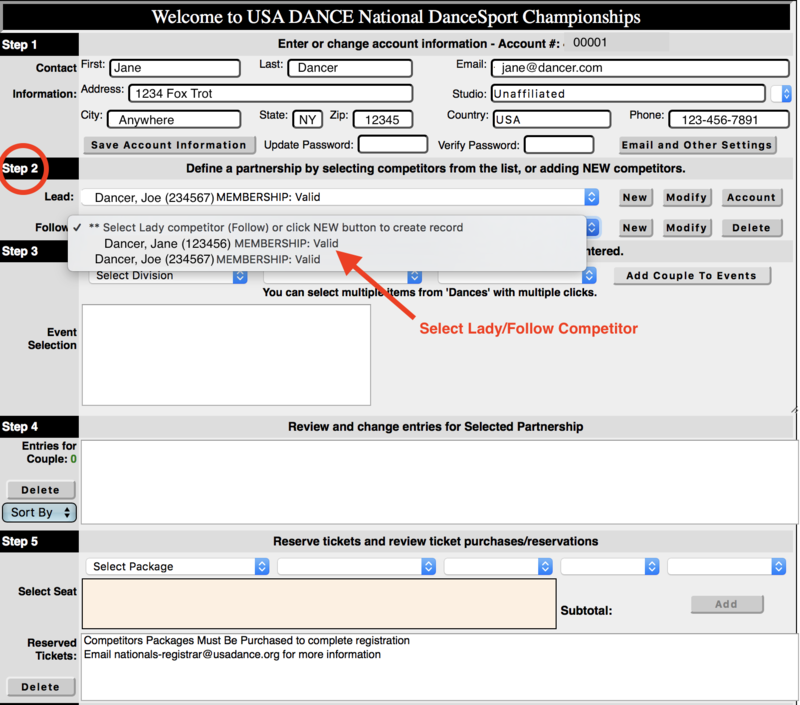 Step 2: Define a partnership by selecting competitors from the Lead and Follow drop down menus or add a new competitor. 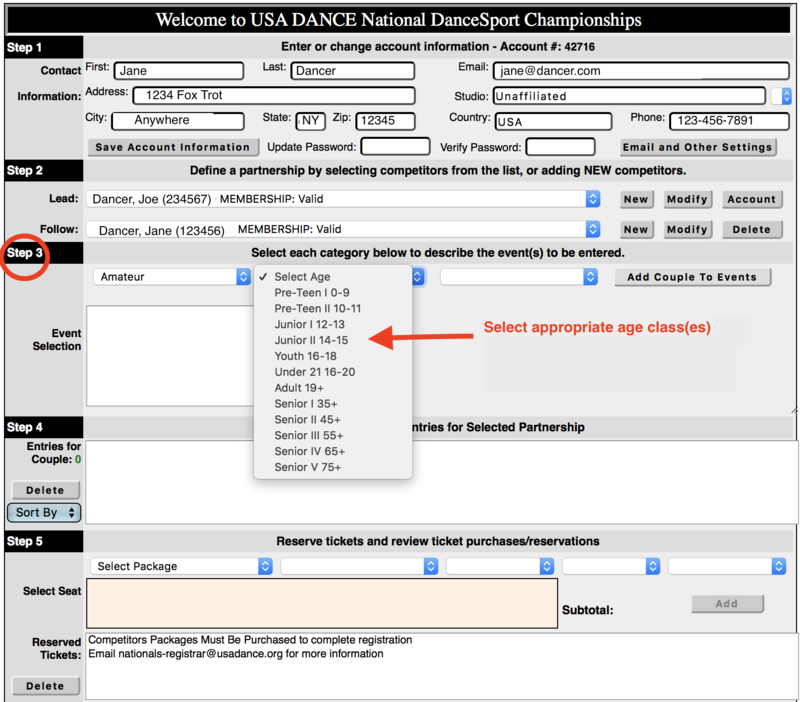 Step 3: Select an appropriate division, age class and skill level; select from the available single dance and/or multi events. Step 4: Review the entries for the defined couple. 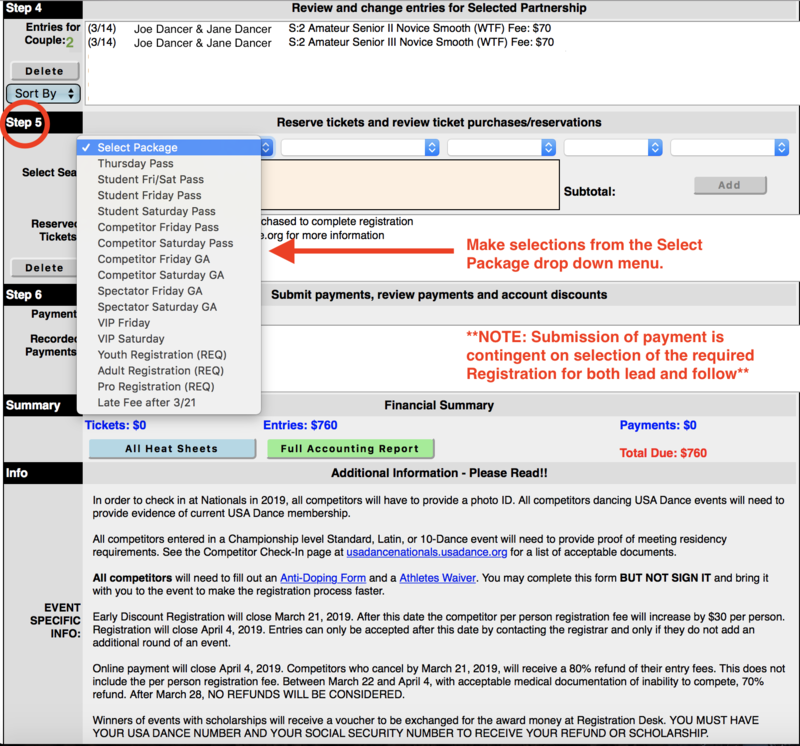 Step 5: Select required Registrations, reserve competitor passes and tickets, and review purchases. Note: This competition charges a fee per couple for each event entered as well as a required general registration fee for each competitor. Submission of payment is contingent on selection of these registration fees. Once all selections have been made in Step 5, click the add button. Be sure to complete Step 5 for both members of the defined couple. Please note daily passes are required for competitors to enter the ballroom at all times. 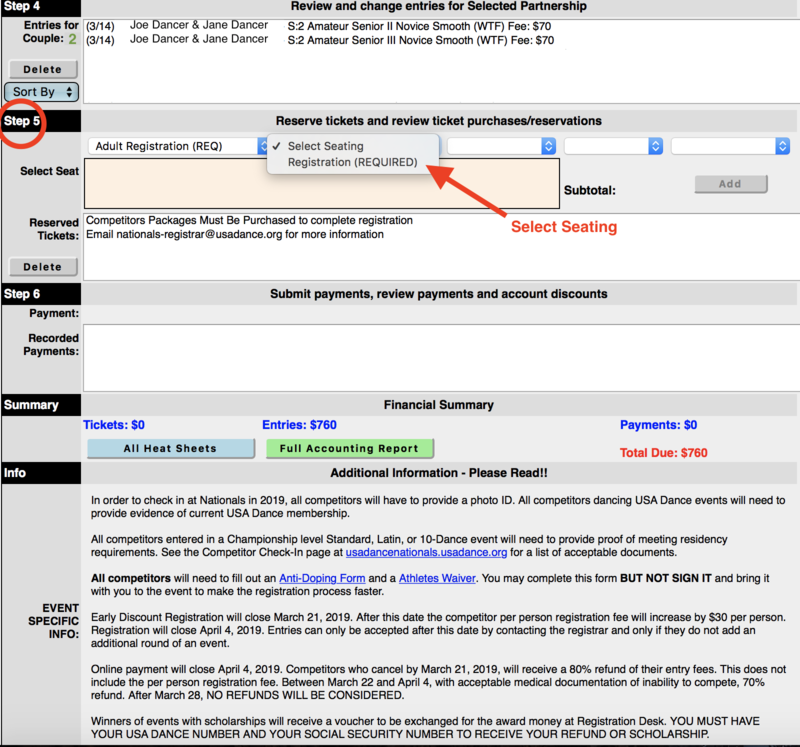 You may reserve competitor passes and other spectator tickets in Step 5 or you may purchase them on site when you arrive at the competition. It is my understanding competition passes and other spectator tickets reserved and paid for in Step 5 will be held at Will Call. There is no PayPal payment option. The only payment methods available are Visa and MasterCard. 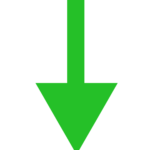 Be advised there is an additional convenience fee calculated at a rate of 3% of your total registration fees. For example, my total fees for all events, two Adult Registrations and Competitor passes for Friday and Saturday for two competitiors is $920, but my credit card was charged $947 representing a 3% or $27 convenience fee for the “convenience” of not having the option to use my preferred Discover credit card or PayPal. I hope this helps. 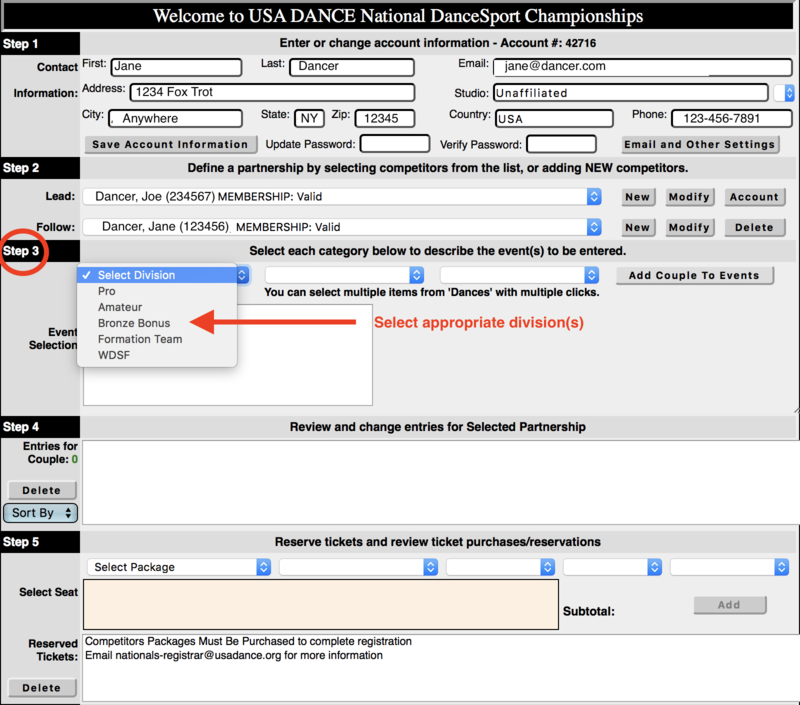 If you run into stumbling blocks not addressed here, have additional questions or would like to express concerns, please email the USA Dance National DanceSport Championships Competition Organizer at president@usadance.org or the o2cm developer at markt@o2cm.com. You may also click HERE to contact The Dancing Housewife for assistance or just to say hello. 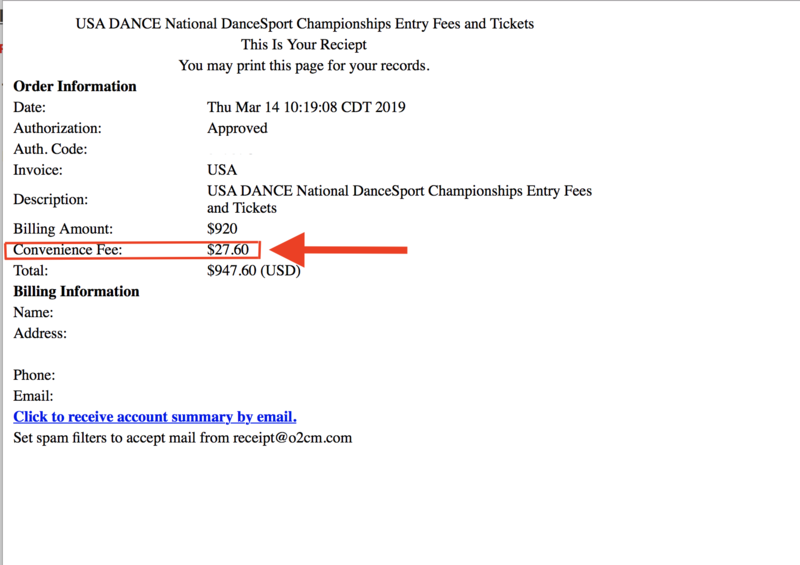 This entry was posted in The Dancing Housewife and tagged o2cm, registering for USA Dance Nationals, The Dancing Housewife, USA Dance, USA Dance National Dancesport Championships by The Dancing Housewife. Bookmark the permalink.